Based on this in-depth analysis, Sales Renewal develops a set of recommendations hand crafted for your specific business, competitive situation and budget. 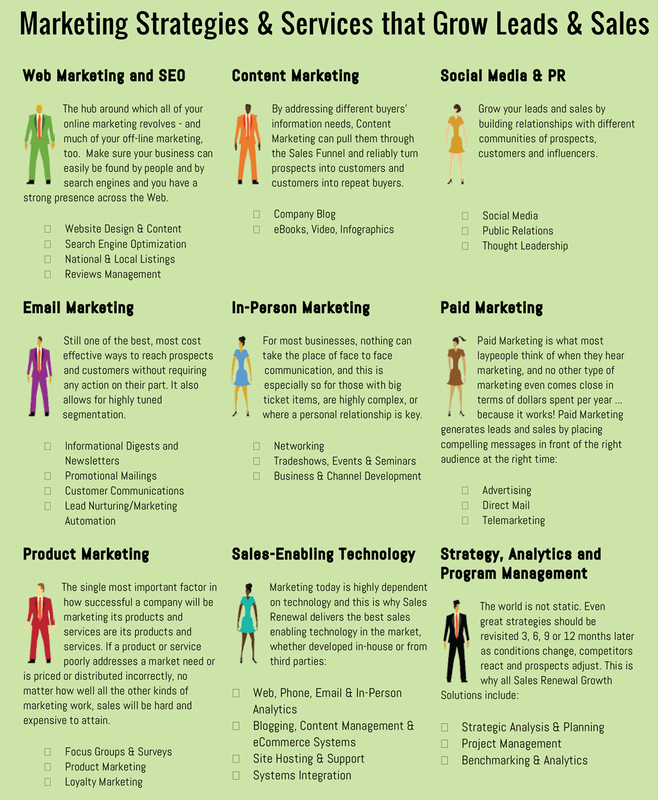 These might include changes to your business branding & positioning, marketing strategies & tactics and sales-enabling technology. (1) Sales Renewal does not simply make recommendations; it also delivers a detailed proposal to put the changes into place and to manage them on a daily basis for a year (even including a month-by-month operating budget). (2) Sales Renewal puts its money behind its strategies: because JointSourcing shares the reward & risk, we have a significant financial interest in recommendations that will cost-effectively grow sales. The Blueprint then continues when, in person or over the phone in two sessions, we collaboratively proceed through a comprehensive business and marketing questionnaire. This JointSourcing Questionnaire, through its many open ended, pointed questions, is designed to facilitate conversation, collaborative brainstorming and critical analysis of what has and has not worked in the past. It also uncovers your goals and strategies, customer, prospect & industry profiles and your sustainable competitive advantage. Prior to the first Blueprint session, we will also ask you to complete an inventory of your existing sales, marketing & technology assets so that they can be built upon and not reinvented (saving time and money). 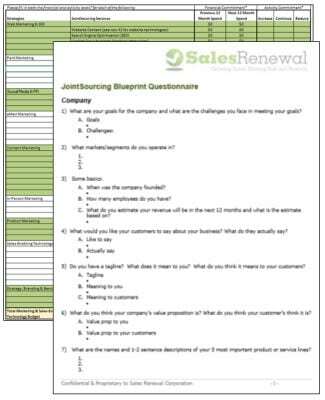 After the JointSourcing Questionnaire is complete, Sales Renewal presents marketing and technology insights garnered from your competitors: a detailed, page-by-page review of your 2 or 3 most important competitors’ websites, analyzing them for messaging, positioning, audience, style, functionality, and more. Based on what we learned during the questionnaire discussions, competitive review and our own independent research, we hold a Strategy Review where together we discuss a range of recommendations for the strategies and tactics that will best grow your business. Based on your feedback to those, we then have a final meeting to review our Build & Sell Proposal: the specific, 12 month plans and budget that support the strategies & tactics you approved. The best strategies, programs and tactics for cost-effectively growing your business (selected from the entire sales and marketing universe). Build out and configure the strategic and technological infrastructure the Sell Services will rely on (for example, if direct mail will be sent out during the Sell Services, the lists will be purchased and mailings designed during the Build Services). The budget includes not just fees and commissions paid to Sales Renewal but all other marketing and sales-enabling technology expenses (e.g., advertising costs, printing expenses, hosting fees, etc.). This is the budget that Sales Renewal will “manage to” over the year. Importantly, both the budget and marketing strategies and plan are not fixed over the course of the year. 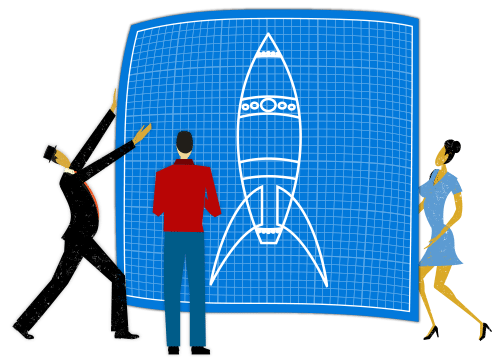 In fact, every 3 months we hold a Quarterly Marketing Review where we use extensive analytics to determine what’s working and what’s not so that we can make appropriate adjustments. This continual review process leads to dramatic improvements in marketing ROI. While most firms do choose to move forward with Sales Renewal’s Build & Sell Services, there is no obligation to do so. And whether you do or not, the deliverables, and the good ideas they contain, are yours to keep.